Anelina is officially retired after consultation with our veterinarian Dr. Stenslie. She worked great on Saturday and came back to the barn fine. However, she began to exhibit swelling in the right ankle (the opposite of the one that was previously injured). Upon x-rays Tuesday morning it was discovered that she has a fracture on the outside of her sesamoid bone in her right front ankle. It does not require surgery, but she will not race again – now – nor after time off. She is now on “lay up” again in Sharon’s barn. 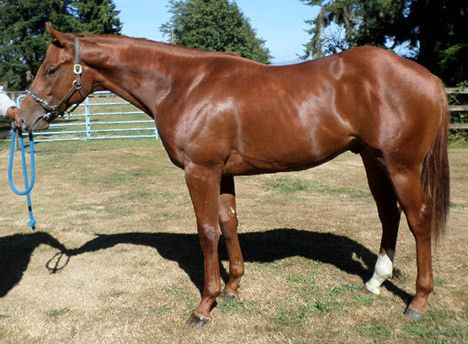 She is available as a broodmare prospect for any Emerald Racing Club members interested in pursuing that with her. If you are, email me at emeraldracingclub@gmail.com and we can discuss details. You are truly experiencing the full gamut of being an owner. From the highs of winning, to the lows of having to retire a successful racehorse. Anelina has given us great joy and pleasure with her friendly personality and voracious appetite for carrots. We can only do the best for her in return. Dancing Yodeler ran a game fourth yesterday. 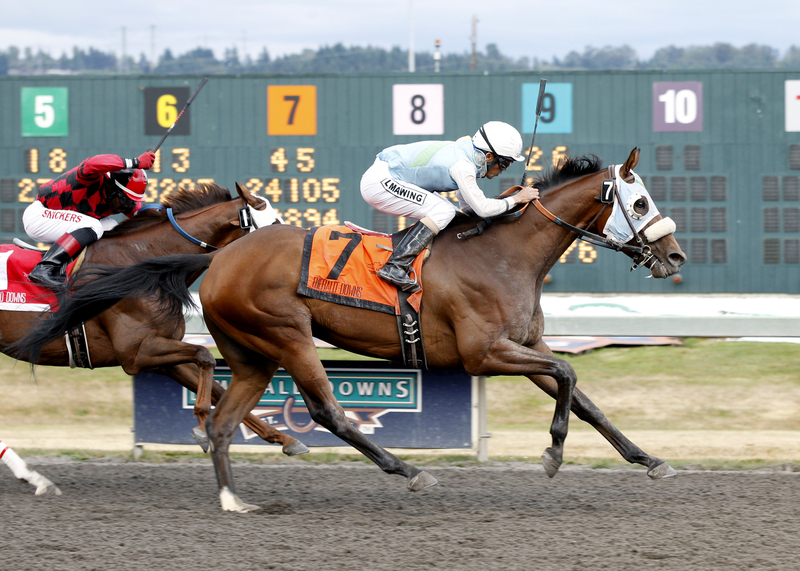 Replay at http://www.emeralddowns.com > Racing>Race Replays. Full chart here. He earned $480 for his 4th place effort. 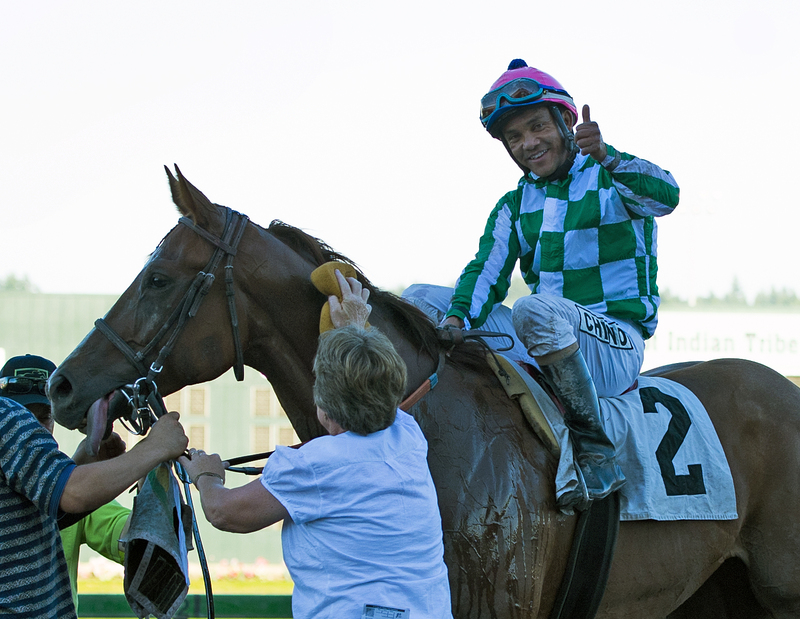 Your appreciation and applause for him when he returned to be unsaddled did not go unnoticed. Longtime horsemen were commenting on how impressed they were that all of Yodeler’s owners stayed to give him an ovation. Well done! Dancing Yodeler (#2) closes steadily to finish fourth. Photo by Hilary Hutchison. Dancing Yodeler returns after the race with jockey Leslie Mawing. His trademark tongue is in full display. Photo by Erin Palmer. Yodeler will get a short break before his next start. He’s been running hard every two weeks for two months and if you watched him yesterday, you could see that even though he was giving his best, he appeared a bit tired. He came back fine and appears to be good this morning. Because the races had been cycling every two weeks, we can anticipate his next race coming in four weeks provided he bounces back with his usual gusto but Sharon will continue to monitor his health and attitude. Anelina had her first work since her injury – an easy 1/2 mile under jockey Leslie Mawing. She was 4 of 7 for the distance going in 49.80. Dr. Stenslie will evaluate her on Monday. Anelina and jockey Leslie Mawing after their work. Photo by Hilary Hutchison. Sharon watches Anelina after her work. Photo by Hilary Hutchison. Reminder that the Yearling Sale is Tuesday, August 26 at 2 pm. Seating and admission is free. You’ll see me wandering around the barn and sales pavilion – say hi! Yearling viewing is any time 8 am – 4 pm until the sale. For viewing, you can enter the North security gate (behind the Sales Pavilion) and there’s a courtesy golf cart that will run you back to the temporary stalls. Or you can walk back. “Window shopping” is encouraged so don’t feel awkward just strolling through and peaking in each stall. Pick up a catalog when you arrive and the horses will be noted by their hip numbers. Keep your head up. On occasion a frisky yearling can get loose from it’s handler and we don’t want you to get run over. 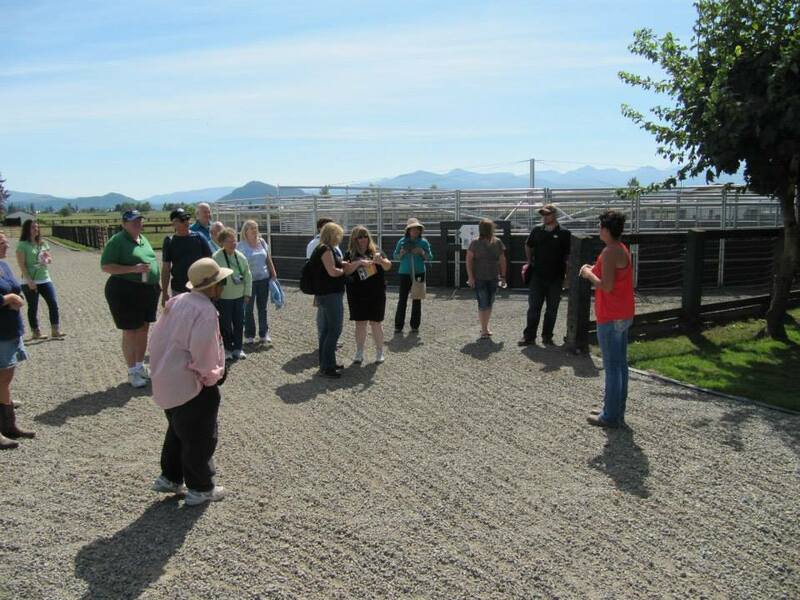 You’ll likely see some familiar faces that you saw at the farms – Debbie Pabst from Blue Ribbon, Mary Lou Griffin from Griffin Place, Nina Hagen from El Dorado, and Rosalia DiPietro from DiPietro Thoroughbreds. And because it’s Mile Day…it’s worth noting that Jebrica ($15,000) and Stryker Phd ($45,000) were purchased out of the WTBOA Yearling Sale. They have earned $327,576 and $182,751 respectively. Meet by the entrance to the paddock immediately after the fifth race. We have a short list, so if you are hanging by the paddock, I’ll bring in as many repeats as I can. REMINDER: NO barn visits Saturday and Sunday. The barn thanks you! There are NO BARN VISITS on Saturday and Sunday. Please respect Sharon and her staff as they prepare for a big weekend of races and refrain from visiting the barns. However, Anelina is scheduled to return to the work tab on Saturday with her first work since the layoff. Since many of you are eager to see her, Sharon has scheduled the work for 9:30 am Saturday, and she will join Club members at the Breakfast at the Wire for the work. Breakfast at the Wire – a casual morning workout show from 8 am – 10 am every Saturday morning in August. You can order breakfast for $6 (cash only) and watch the workouts while guests from the backstretch stop by to chat. It is located by the finish line under the building overhang by the Trackside Deli (south end of Grandstand, track level). Just enter the track by the paddock gate. Paddock list will be posted Friday afternoon. The WTBOA Yearling Sale is Tuesday, August 26. Beginning Saturday (8 am – 4 pm) is the yearling preview in the temporary stables. They are located at the North end of the barns and it is best to enter the North Security Gate (keep going North past the Quarter Chute Cafe on Emerald Downs Dr then turn right past the Sales Pavilion). The sale starts at 2 pm on Tuesday and you will likely see me there, Will, Darrin, Rosy, and the whole crew! Be sure to say hi and we’re happy to walk through and offer our comments. Also, yearling photos are being posted on the WTBOA website and are listed by hip number. At the Sales Seminar we mentioned keeping an eye on Hip 16. The colt is by Lucky Pulpit (sire of KY Derby winner California Chrome) and out of the dam Eclante. This horse is a half brother to Trackattacker – winner of three straight and the most impressive two year old on the grounds. 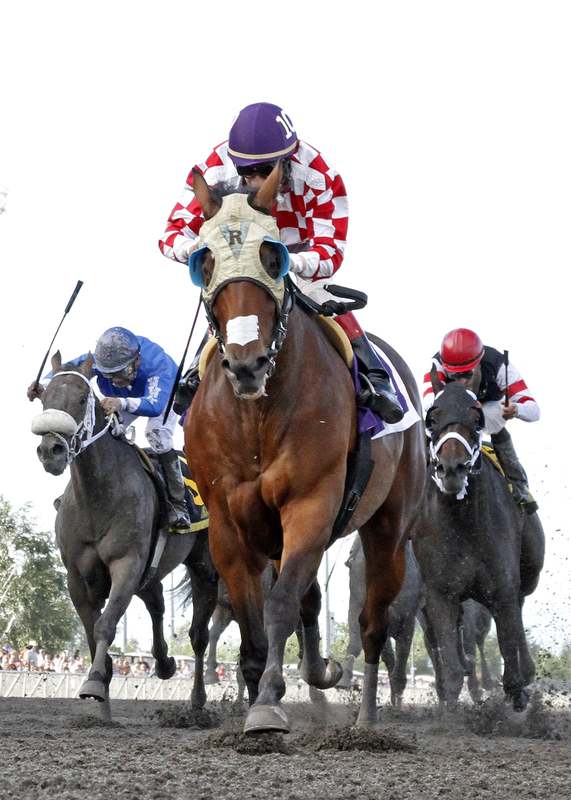 He set a track record in his first start, and a stakes record in his second start. He’s won his three starts for a combined 27 lengths. 74, 76, 59. so we expect this handsome colt to get some attention thanks to his older brother. Each year we the Emerald Downs Chaplain hosts a Backstretch BBQ Picnic and Carnival to benefit the Chaplaincy and it’s programs for backstretch workers. Volunteers needed 8/27 from 1 – 4 pm, and Thursday 8/28 12 – 5 pm. If you are interested in assisting with setup, carnival games, and clean up please contact Jodi at wranglersj@comcast.net. Yodeler is entered in the 6th race on Saturday, August 23. Overnight is here. If you HAVE NOT been to the paddock this year, RSVP for the Paddock, click here. Please do so by Friday at noon. There are a couple of you that have not yet put in, or made it into the paddock so please RSVP. If there aren’t enough of you, then I will open up the RSVP to the others and we’ll start cycling through again. Tickets will be left at the Will Call gate under Emerald Racing Club for your added guests. Reserved Seat Section 15, as always, is reserved for horsemen (that’s you!). You may have missed the race in the condition book because this is not a claiming race. But how does our claiming horse manage to not run in a claiming race? This is a “Starter Allowance” race which means that he can not be claimed. In the past we have referred to the “Allowance horses” as those a step below Stakes horses. Essentially horses performing at the top of their game where they aren’t at risk of being claimed. However, the “Starter Handicap” or “Starter Allowance” category is reserved for horses that have been running in inferior claiming company, but have improved to the point that they would not be risked being sold in a claiming race. In effect this race is an allowance race restricted to horses that have previously run in a claiming race at a specific level (e.g. starters for a claiming price of $3,500). We will tend to see these races towards the end of the season and the purse is worth $200 than our usual $3,500 purse. We meet the conditions and are eligible. We are an Older horse so our starting weight is 124lbs. “Non-winners of two races for a starter or claiming price of $4,000 or more since January 1, 2014 … 2 lbs”. We must review Yodeler’s Past Performances to see if we are allowed our 2 lbs. Since January 1, 2014 he has won for $3,200 (March 15), $3,500 (July 13) and $3,500 (August 9). Non of these races were over $4,000 so we subtract 2 lbs from our starting weight of 124 = 122 lbs. We have not won a starter race, nor have we won for a claiming price of $4,000 or more so we are allowed the 5 lbs. We don’t get to add both together and take off 7 lbs, we just get to have one allowance (124 – 5 lbs = 119). Yodeler will carry 119 lbs on Saturday. Yodeler will break from post position 2 in a field of 8. Jockey Leslie Mawing will be aboard again. Dr. Stenslie will look at Anelina tomorrow morning. Provided she still looks good, she will plan to work this weekend. Sharon will give us a heads up on when (depending on weather and track conditions) since many of you are eager to see her return to the work tab. Herbie D winning the 2013 Longacres Mile. 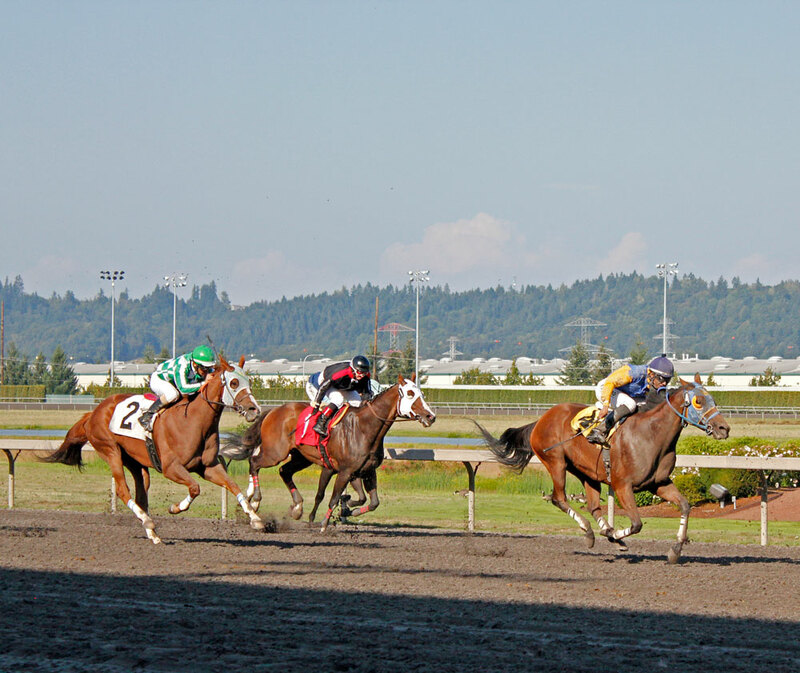 Around here it’s simply referred to as “The Mile.” The richest race in the Northwest, the Longacres Mile’s purse is $200,000 and it is the only graded Stakes race at Emerald Downs. “Graded” refers to an assignment of Grade I, Grade II, or Grade III (also Grade 1, 2 or 3). A race is assigned it’s “graded status” by the American Graded Stakes Committee. All grades issued, denied, or altered are voted upon by a quorum of the Committee at a duly called meeting. A quorum, for the purpose of grading races, is a majority of TOBA (Thoroughbred Owners and Breeders Association) members on the Committee and a majority of Racing Officials on the Committee. Eight affirmative votes are required to upgrade any race and six affirmative votes are required to downgrade a race. In a nutshell, grading is based on purse money, quality of horses competing over time, and establishment of the race. You can read more about the criteria here. Stakes races, and in particular The Mile, function differently than a normal race. 1) There’s a nomination process. In the case of The Mile, nominations closed Sunday, August 10. 2) There is a nomination fee of $250. A horse must be nominated in order to be eligible to enter. 3) Once the list of nominated horses is complete, then the racing secretary assigns the weights. This is what constitutes a “handicap” because the horses are assigned weights based on their past performances. Theoretically, the best horse receives the highest weight, and the least competitive horse receives the lowest. The aim is to level the playing field and make the race as competitive as possible. 4) Weights are released Saturday, August 16 with “high weights preferred.” This means that if more than 12 horses enter, the twelve with the highest weights will get preference. 5) Regular entries are taken on Wednesday, August 20. An additional $1,500 is due at entry. Once entries are closed, we have the ceremonial “post position draw”. 6) On race day, an additional $1,500 is required to start. The additional entry fees all go into the purse. The above process is specific to the Mile and is outlined in the condition book. The Mile is a unique race with tremendous history behind it. If you have an opportunity to make it to the track on Sunday, it is well worth it to see the best horses assembled for the 79th running. We anticipate a full field of 12 with the Ross trained Stryker Phd as one of the favorites. Stryker Phd winning the Mt. Rainier Handicap. He lives in the Ross barn with Anelina and Yodeler. He is the local favorite in the Mile, hoping to fend off invaders from California, Canada and Idaho. The vet continues to monitor Anelina and she will work soon. She’s showing no indication of edema in that ankle and according to Sharon she is happy to be back on the track. A decision has not yet been made on his next race. There is a race for Saturday, August 23 that he meets the conditions for, but Sharon is unsure at this time if she will enter him. Entries close Wednesday for Saturday. Some of you have inquired as to how we made the decisions on when he runs. The decision on when he is right, fit and happy to run is 100% left to Sharon and Larry. The decision on what level he runs at is discussed between myself and Larry and Sharon but ultimately I leave the decision to them. This is not the case in all owner/trainer relationships, but it is the one that we agreed upon and feel is in the best interests in the horse. As an owner, you must be in a position where you are comfortable with the decisions being made. If you aren’t, then you need to communicate that clearly to your trainer or find one that works better for your objectives. 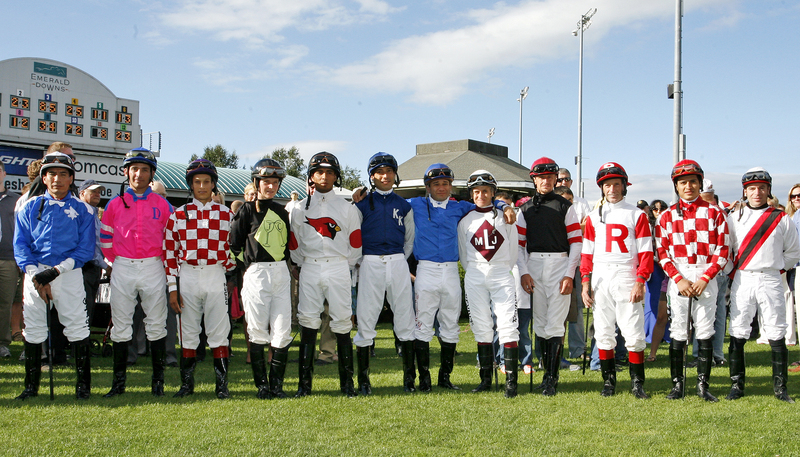 The jockeys for the 2013 Longacres Mile. There is a special Jockey introduction prior to the running of the Mile. 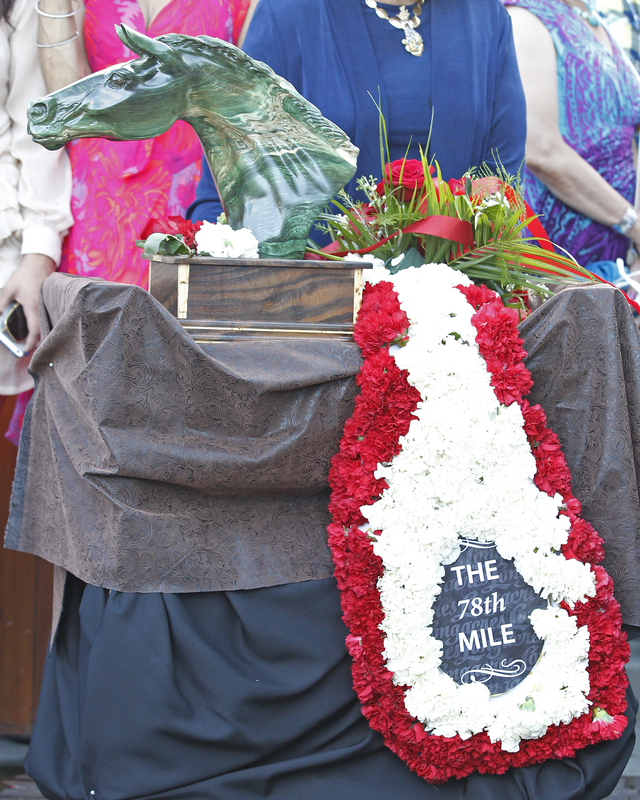 The 2013 Longacres Mile Trophy was commissioned for the Mile and was carved from wood by Oregon artist Mike Bryant. A special blanket of flowers is also placed on the winning horse. 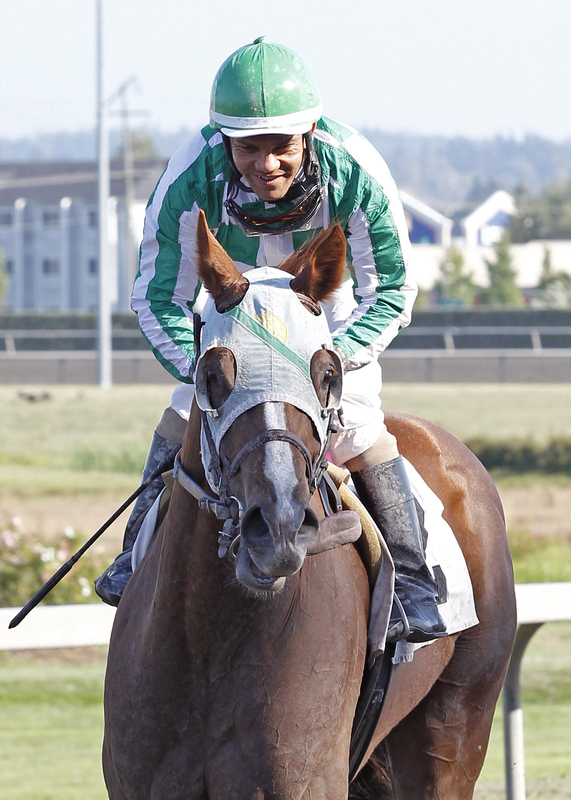 July was a productive month for the Emerald Racing Club with Dancing Yodeler winning one race and finishing second. This post is long and detailed so if you look at nothing else, look at the updated July Budget sheet. It summarizes all that will be delved into below. Emerald Racing Club July Statement shows $3,410 for his victory on July 13 and $1,240 for his second place finish on July 27. Total July income is $4,650. Amount paid to the jockey (10% of the win less agent fee): $255.75 and $56.25 respectively. Jockeys earn 10% on the Win, and a scaled fee for the other placings (chart is found in Condition Book). In this particular race, the jockey received $75 for second less the 25% agent fee resulting in the $56.25. The statement also shows the previously discussed “Horse Retirement Fund” ($5/race) and the “Jockey Insurance” ($6.50/race). The July Training Bill is also straight forward. Total training bill is $3,474.20. From that we are looking pretty good. If we figure in the race day medication bills that includes the Lasix, Bute and vitamins shown on the Cavalli Vet Bill for $163 we still turn a profit. We did finally receive a vet bill from June and July for Anelina and Yodeler that negated our gain. Comparing the Sporthorse Medicine Vet Bill and the Cavalli Vet Bill is actually a good exercise in showing two different methods of invoicing. In either case, it is important to carefully review the records and check against what the trainer has billed. In this case we found one mistake where the vet had inadvertently charged us for some medicine for Anelina that we were also charged for from Sharon. The vet bills from Sporthorse are separated by the horse’s name noted at the top. You’ll see that Yodeler received his joint supplement Voren (administered as Adequan on an earlier post) and Chondro used to help with body soreness. This is standard operating for him and shows up consistently a couple days before he runs. So we see the same routine as in his earlier races. Now let’s look at Anelina. In June she received Regumate. The $300 is for a bottle of medication that lasts four to five months. It is administered orally and Regumate is given to mares to keep their temperament “regular.” Just like women may get a bit testy once a month, mares can also act “mare-ish.” The medication evens out the mare’s behavior so they can focus on their job – being a racehorse. It also makes the barn a bit more peaceful all around. Next we saw the same maintenance treatment that Yodeler receives, the Voren and Chondro. This was shortly before her first race. Radiographs (4 views) for $180, sedative so they could get the x-rays for $15 and Naquasone ($5), which is a diuretic and is mixed in her food and is used to draw the fluid out so they can see the joint better. We then entered the period where she’s awaiting her ultrasound. Isoxiprine and Apirine were given in oral form to help break up the suspected blood clot. This is the vet bill that we are following up on because we were already billed by Sharon and were mistakenly billed here again. Approximately a week after her injury we walked her over to the clinic and she was sedated ($15) for the ultrasound ($180). When we take into account both horses and that the bills span over two months the vet bill totals $1,180 (less the $80 we believe to be a mistake). At the end of the season, I will break down the income and expenses by horse so we can see it that way as well. I realize the expenses and what it entails can get a bit cumbersome so if you’d like further explanation on a particular item please post your question in the comments and we’ll do our best to expand further. It’s a subtle nod to a winning barn. The brown, unassuming donut box, the lid halfway closed, donut crumbs spread below the bench it sits upon. There are certain traditions in racing that are the same no matter where you go, and donuts are one of them. In racing, if you win, the next day the winning jockey (or his agent) deliver a box of donuts to the winning barn. It’s even a deductible expense on a jockey’s tax return. It’s a gesture of thanks to the team at the barn. It is also common place for an owner to “stake” the jockey, groom, trainer or exercise rider. In the case of Sharon’s barn, she automatically charges 2% of prize money for her grooms. However, any additional stake is at the discretion of the owner. Emerald Racing Club will “stake” an additional $50 each for the groom, jockey, trainer and exercise rider for their work. It will be listed as a miscellaneous expense on the budget totaling $200. Yodeler cooled out of his race great. We swung by the barn today for a quick visit and captured Yodeler goofing off with his tongue (if you are reading this in an email, go to http://www.emeraldracingclub.com to watch the video, it is 5 seconds long). He’s tired, but happy. 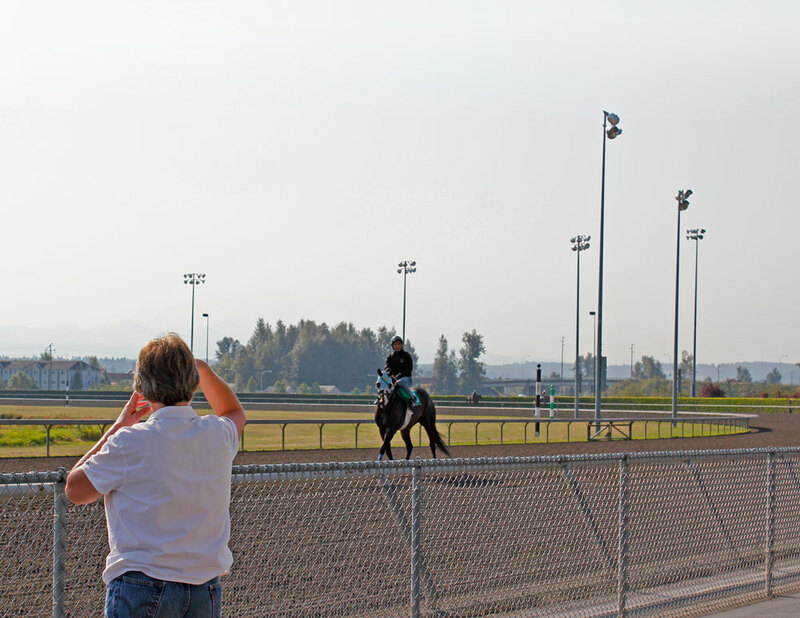 A reminder that Reed Palmer Photography, the official track photographer of Emerald Downs is offering discounted “Win Photos” for the Emerald Racing Club members. You may purchase your Win Photo direct from them for $10. You can stop by their office on race day (located on ground level to your left as you exit the last escalator). 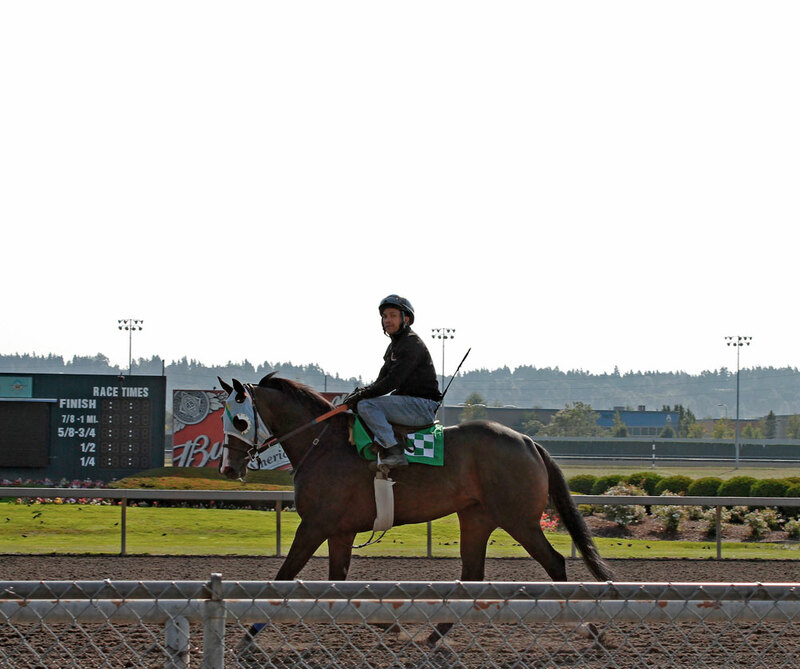 You can also email reedp@emeralddowns.com. Please include your name and phone number with your email. They are only in the office on race days so don’t expect a response during the week. For the DVD, it is also $10. Please email emeraldracingclub@gmail.com and you’ll be instructed on payment and pickup. Photo by Reed Palmer Photography. 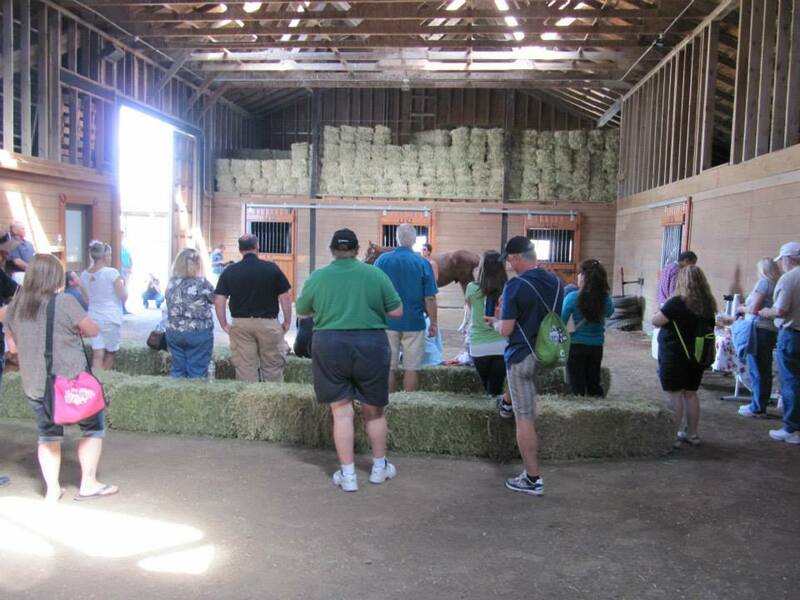 Rosalia sent over some great photos from the group’s barn trip to DiPietro Thoroughbreds. Great reports all around and Darrin Paul and Will Brewer really enjoyed hosting the trip. Next Club activity is the WTBOA Yearling Sale. The sale is held on Tuesday, August 26 at 2 pm at the WTBOA Sales Pavilion located at the North end of Emerald Downs Drive. This is North past the three way stop for the main stable gate and Quarterchute Cafe. The seating is free and completely open, no reservations required. You are permitted to move freely from the sales pavilion to walking area to barn area. Just don’t sit in the very front rows as they are typically reserved. There are hot dogs and beverages available for purchase. Children are welcome as well but must be watched and be well-behaved as the yearlings can be very jumpy and they need to perform their best for potential buyers. Viewing of yearlings takes place beginning Saturday, August 23, 8 am – 4 pm up until the time of the sale. The viewing can be accessed through the NORTH stable gate located right near the Pavilion. Then walk straight back to the temporary stalls (white barns) where they are all housed. If you’d like a catalog, pop in at the WTBOA offices located adjacent to the Sales Pavilion and they have them available. They are free. The barn at DiPietro Thoroughbreds. Rosalia demonstrates how to bathe a baby. Rosalia demonstrates the equine exercise machine. 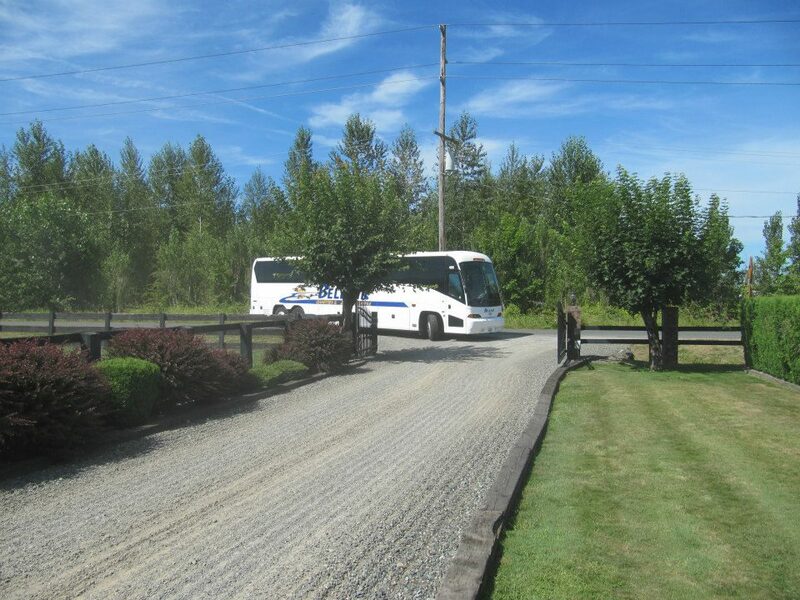 The bus arrives at DiPietro Thoroughbreds. Ana has returned to the track and has been jogging. Dr. Stenslie is scheduled to stop by and see her tomorrow and if good will gallop. She’ll need two to three works before we can begin looking for another race for her – assuming that she continues to progress well and stays sound. Yodeler did it again, winning in heart pounding fashion with another come from behind victory! For Race Replays go to http://www.emeralddowns.com then “Racing”>”Race Replays”. Results will be posted at Equibase.com under “Results”>”Full Charts.” They aren’t up as of the writing of this post. The charts are input manually by the chart caller from Equibase. They should be active in the next 20 minutes. More to come (including photos) tomorrow. Savor your win owners, you have now just moved into the NW3 (non-winners of 3) condition! Please meet at the paddock immediately following the 8th race.